Sweet children, become soul conscious and you will easily develop the speciality of breaking off your relationships with the old world and forging a relationship with the new world. Your love for the one Father will be forged. The intellects’ yoga of which children can remain constantly connected to the Mother and Father from beyond? Those who die alive and remain constantly engaged in Godly service; those who, while living at home with their families, do the service of connecting the intellects of everyone in yoga to the Father, who give others the enlightenment they have received from the Father, and who show others the way to become pure in order to make them into the masters of heaven. The intellects’ yoga of those children is automatically connected to the Father. Who is the Father and who is the Mother? What is the meaning of the song? It is said: Forget your physical mother and father and your friends and relatives etc. and connect your intellects in yoga to your true Mother and Father, who is the Creator of the World. You now have to break off your relationships with those parents and your friends and relatives etc. and connect it to the One. That One is also called the Mother and Father. “You are the Mother and Father, and we are Your children”. Everyone says this to the One. Everyone's physical parents are different. That One is the Mother and Father of the whole of Bharat, of the whole world. Therefore, you have to belong to the Mother and Father from beyond and leave your worldly friends and relatives. For this, you need the knowledge of how to become soul conscious. Unless you become soul conscious, it is very difficult to become free. You have to break off your relationships with this old world and connect them to the new world. This is a speciality. To break off relationships with one limited home and forge a connection with another limited home is very easy. You break and connect in every birth; you leave one set of parents and friends and take another. When you shed your body, you have new parents, new friends, relatives and gurus etc. Here, it is a question of dying alive. You are adopted while alive by the Mother and Father from beyond. You have to forget all the iron-aged parents etc. That One is the Father but how He is also the Mother is a very deep matter. The Father adopts this body and makes you His children through this one. However, some children repeatedly forget this. On the path of ignorance, they never forget their parents. They forget this Mother and Father because this is something new. You have to connect your intellects in yoga to that Mother and Father and then remain engaged in service. Just as the Father is concerned about service, so you children should also be just as concerned. It is said: God was concerned to make the world new or create the new world. So, this is such a great concern. The unlimited Father has the unlimited concern to purify everyone. He has to teach Raja Yoga for that pure world of heaven. He has to teach this to so many. The intellect's yoga of everyone has to be connected to the Father. This is the business of us children. The Father says: While living at home with your families, you children have to do service. Sannyasis are concerned to liberate others from the happiness that is like the droppings of a crow and to make them pure. They too have a responsibility to make others have disinterest and make them pure. They believe that they have to leave their homes and families. They don’t understand that they have to leave the impure world. It is only when the Father comes and grants a vision of the pure world that we break our connections with the impure world. Nevertheless, they still consider themselves to be responsible and so they leave their homes and families and inspire so many others to have disinterest and make them pure. Their praise is also sung. If there weren’t that religion of renunciation, Bharat would have been burnt completely away on the pyre of lust. The Father sits here and explains who establishes that rajoguni renunciation and who establishes this satopradhan renunciation. Their head was Shankaracharya and he too had so many followers. There would probably have been hundreds of thousands or millions of them. If they hadn’t remained pure, the number of people following them would not have increased. Therefore, the sannyasis have done some good. Deities are considered to be the first number and sannyasis are considered to be the second number. Everything depends on purity. The world has to become impure from pure and pure from impure. Whatever has happened in the past from the golden age onwards is fixed in the drama. Whatever visions you have had on the path of devotion, second by second, you will have those same visions again after a cycle. All of this is fixed in the drama. You have to understand the drama and the cycle. Don’t just sit down and think that whatever is in the drama is fine. All are actors in the drama , but each one still makes effort for his or her own livelihood. No one can stay without making effort. Many people understand that this is a play and that we have come from the supreme abode to play our parts but they are unable to explain this in detail. They don’t know which religion comes first or how the world is created. Because of not knowing whether a new world is created or whether the Father comes and makes the old world new, they have shown annihilation and then shown the new world. The Father comes and enlightens you about these things. Then, you too are responsible for enlightening others. There is so much service to be done. The Father has shown you the path to liberation and liberation-in-life, for which you have been stumbling around on the path of devotion for half the cycle. The unlimited Father is concerned about how to make His Salvation Army grow and how to show everyone the path. You children should tell everyone that the Father has come to teach you Raja Yoga exactly as He did in the previous cycle. It is to Him that people say: Salutations to Shiva. He is the highest of all and He resides in the supreme abode. All of us souls also reside there. Souls are always considered to be immortal; they never burn or die. Each soul has a part recorded in him. Look at your own soul and look at the souls of the main ones. When you look at the tree, you think about the main foundation and the branches and twigs. There are so many leaves that you cannot count them; it is possible to count the branches and twigs. Therefore the foundation of this tree truly is of us deities. The foundation has now decayed just like the foundation of a banyan tree. Nevertheless, so many branches have emerged. Leaves continue to emerge from the branches. Therefore, this too is such a big, unlimited tree. You children know this, numberwise, according to the effort you make. It isn’t that someone’s intellect thinks about this throughout the day. It is difficult for all the points to be churned at the same time by your intellects. Nevertheless, these points continue to trickle into the intellects of those who churn the ocean of knowledge. When you have the tree in your intellect, you also remember the Father, the Seed. We too are residents of that place and then we are the all-rounders of this tree who come at the beginning and stay till the end. When you reach your impure state of total decay, the whole tree also reaches that stage. Those who existed at the beginning have also now become old. The branches that come later on are also old. Those who are serviceable are concerned to be Baba’s helpers to change human beings into deities once again. This has to be explained. You were deities and you then became warriors. Only you can talk about your horoscope of 84 births. Only when these things continue to trickle into your intellects will you be able to explain to others. You should think about how you children are Baba’s helpers. So, it should enter your intellects how you can explain the secrets of the drama to anyone, how to connect their intellects in yoga to the Father and inspire them to make effort to change from human beings into deities, that is, to show them the way to claim their unlimited inheritance from the Father. Only those who have been shown the way by the Father would show it to others. The Father alone comes and teaches you Raja Yoga, that is, He opens the gates to liberation and liberation-in-life. Continue to churn the ocean of knowledge in this way throughout the day. You also have to imbibe a very sweet nature. You mustn’t burn or die because of someone else’s nature; you have to tolerate it. Serve yourself. As much as possible, give time for service. Ask yourself: Do I constantly say, “Baba, Baba”? Baba is concerned about unlimited service: What am I, a child of Baba’s, doing? I should do so much service! You have a lot of time. You should feel mercy for all the poor ones who are separated from the Father. They continue to stumble around and commit sin. People divert you from the Father and confuse everyone. It is the duty of you Brahmins to give everyone knowledge and bring them in front of Baba. You Brahmins are the true children of the God of the Gita. You have been given authority. You only have the knowledge of the Gita in your intellect. Those who can't explain cannot be called Brahmins. They would be called half-caste or quarter-caste. Their name is Brahmins but they do the business of shudras. Their intellects are like those of shudras. In Ajmer, there are the Pushkarni brahmins; they are the ones who relate the Gita scripture. That is their business; it is not their duty to go and eat at people's houses. Their work is simply to read the scriptures and take alms. You are true Brahmins, children of the unlimited Father. Prajapita Brahma is the Father of unlimited people and Shiv Baba is the Father of all souls. His residence is the supreme abode. He is the One who purifies the impure and this is why the whole world remembers Him. When they say, "O God," they have the incorporeal One in their intellects. However, the chains of the gurus trap them. They don't even know the occupation of the deities they worship; they worship them considering them to be dolls. They don't know their occupation, which is why it is called the worship of dolls. So, there is so much difference! Many people are confused about this. There is the difference of day and night between the characters and features of deities and those of human beings. People sing: You are full of all virtues and we are degraded sinners. They say this, so who was it who made them like they are? It is truly hell now, so can we once again become the masters of heaven? People never have this thought. You children too would never ever have wondered whether you could become like them; you simply continued to perform devotion. You know that you now have to become like deities. You have to claim a high status in your kingdom and this is why you are making effort. Internally, you should be concerned about what status you would receive if you were to leave your body now. You can even ask: If I were to leave my body now, what status would I receive? Baba would instantly tell you: You would receive a status worth a few pennies. You would claim a status worth eight annas, twelve annas or even worth shells. The status of a subject is said to be worth shells. Look at your face in the mirror of your heart: Is there any monkeyish behaviour? Impure arrogance is number one. You may conquer lust and anger, but arrogance of the body is the number one enemy. It is only by your becoming soul conscious that all the vices will cool down. Only when your love is connected to the Father can you become soul conscious. The love of those who are body conscious cannot be connected. A lot of effort is required to renounce body consciousness. Those who are soul conscious remain very cheerful. The faces of those who are body conscious are like those of a corpse. Therefore, the first and foremost thing is to become soul conscious. Only then will the Father help. Many people remain viceless, but they repeatedly forget that they are souls and that they have to stay in remembrance of the Father; they fail in this. How would you go back home if you don't remain bodiless? You should be very concerned about service so that many people can be benefited. Wherever body-conscious people go, they fail. Those who are soul conscious come back having shot someone with an arrow. The others would feel that what So-and-so said was right. If your yoga is connected, you would also have concern for service. In that, you first of all have to explain about Alpha. When you speak too much, they get fed up. First of all, you have to explain about “Salutations to Shiva,” and also the three floors. One is the incorporeal world where the Supreme Father, the Supreme Soul, and all souls reside. The others are the corporeal world and the subtle region. There was the kingdom of Lakshmi and Narayan in heaven. It doesn't exist now. History will then repeat. Previously, there was the iron age, then there was the golden age and now the history of the iron age is repeating. Therefore, the history of the golden age will also repeat. There is pleasure in only this. These points are very good. Achcha. 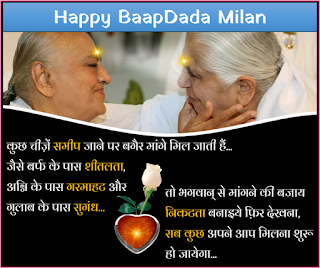 To all the children who are the decoration of the Brahmin clan, love, remembrance and good morning from the Mother, the Father, BapDada. The spiritual Father says namaste to the spiritual children. 1.You mustn't burn or die because of the sanskars or nature of others. Make your nature very, very sweet. Become tolerant. 2. In order to become a helper of the Father, churn the ocean of knowledge. Let your intellect only churn knowledge. Make effort to remain soul conscious. May you be a greatly powerful soul, who, with courage and enthusiasm, achieves success in every task. On the path of devotion, it is said: Courage and enthusiasm are able to change dirt into wealth. If you have courage and enthusiasm, others become co -operative with you. If you lack wealth, enthusiasm would then draw wealth from somewhere or other and bring it to you. It would also draw success to you. The duty of the great instrument souls is to keep themselves enthusiastic and to give enthusiasm to others. It is because you stay in enthusiasm at this time that they show your constantly smiling and powerful faces in the non-living images. Fortunate souls are those who have the canopy of BapDada’s love over them.